This post will be updated multiple times, check back for the latest news. Nikon also established a new holding company in Hong Kong. I will publish the pre-order options as soon as they are available (usually in 1-2 hours). Some of the new lenses will be back-ordered for months, try to place your order asap (Amazon doesn't charge your credit card until the item is shipped). MELVILLE, NY (August 19, 2010) – The new Nikon D3100 digital SLR camera speaks to the growing ranks of enthusiastic D-SLR users and aspiring photographers by providing an easy-to-use and affordable entrance to the world of Nikon D-SLR’s. The 14.2-megapixel D3100 has powerful features, such as the enhanced Guide Mode that makes it easy to unleash creative potential and capture memories with still images and full HD video. Like having a personal photo tutor at your fingertips, this unique feature provides a simple graphical interface on the camera’s LCD that guides users by suggesting and/or adjusting camera settings to achieve the desired end result images. The D3100 is also the world’s first D-SLR to introduce full time auto focus (AF) in Live View and D-Movie mode to effortlessly achieve the critical focus needed when shooting Full HD 1080p video. 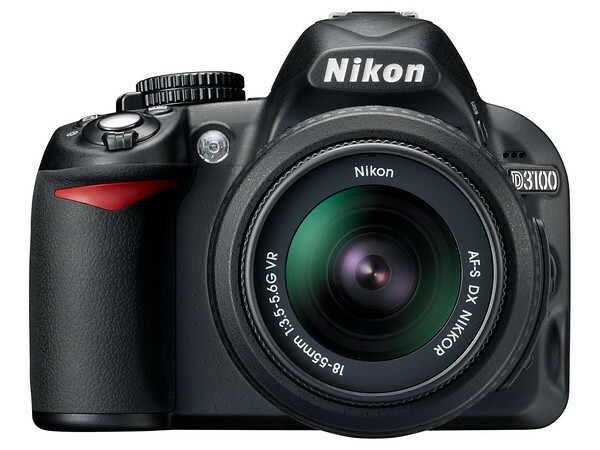 The Nikon D3100 D-SLR allows users to capture stunning Full HD, 1080p resolution (1920x1080) movies. Users can record cinematic quality 24p video clips, or shoot at 24 or 30 frames-per-second at 720p, ideal for sharing online. By incorporating versatile NIKKOR lenses to the equation, users can now create a variety of photography effects to video such as isolating subjects with a shallow depth of field, and recording in low light conditions. NIKKOR lenses also deliver the sharpness needed for HD video, and Nikon’s Vibration Reduction (VR) II technology helps to eliminate camera shake. MELVILLE, NY (August 19, 2010) – Today, Nikon Inc. announced four new lenses to the legendary NIKKOR line to meet the needs of all types of photographers, from those looking for the ideal lens for capturing memories of the school play to pro glass that captures client work in the studio. The new AF-S DX 55-300mm f/4.5-5.6G ED VR, AF-S 28-300mm f/3.5-5.6G ED VR, AF-S 24-120mm f/4G ED VR and AF-S 85mm f/1.4G deliver the optical excellence and stunning image quality that consumers have become accustomed to with AF-S NIKKOR lenses. Nikon’s optical engineering experience and devotion to extraordinary standards of excellence have contributed to the strength and legend of the NIKKOR brand. With the addition of these four lenses, 2010 has seen the introduction of a total of seven new NIKKOR lenses, reinforcing Nikon’s role as the world leader in optics. Ideal for producing stunningly sharp images with excellent clarity and color reproduction or capturing HD video that exhibits critical focus with a dramatic depth of field, these new lenses will empower photographers with a variety of core Nikon technologies. The three zoom lenses utilize Nikon’s Vibration Reduction (VR) II Image Stabilization system which provides up to four stops of correction* to help create blur-free images while shooting handheld or in challenging lighting conditions. Found in the 85mm f/1.4 and 24-120mm f/4, Nikon’s exclusive Nano-Crystal Coat reduces instances of ghosting and flare – even in challenging backlit scenes. Additionally, all four lenses feature Nikon’s Silent Wave Motor (SWM) technology to deliver fast, accurate and quiet AF performance and Nikon’s Super Integrated Coating (SIC) for color consistency and reduced flaring. The construction of each of these lenses also includes a nine rounded blade diaphragm, to help achieve a dramatic separation between subject and background with a natural out of focus area coveted by today’s image-makers. The new AF-S DX 55-300mm f/4.5-5.6G ED VR fills a variety of roles as the perfect lens for family picture takers and photo enthusiasts alike. This lens is the ideal complement to the 18-55mm VR DX-format camera kit lens, such as the one coupled with the just-released D3100 D-SLR camera, and provides users with an affordable way to achieve super zoom focal lengths from 82.5mm to 450mm (35mm equivalent). The 55-300mm VR lens brings the benefits of longer focal lengths into range for users when capturing distant subjects, such as at athletic events, family gatherings and summer vacations. Additional features include a Tripod Detection Mode, which allows users to keep VR image stabilization activated and automatically compensates for minute vibrations when mounted on a tripod. Additionally, a High Refractive Index (HRI) lens element is implemented to keep the lens compact while offering high contrast even at maximum aperture. The optical construction consists of two Extra-low Dispersion (ED) Elements that effectively minimize chromatic aberration, even at the widest aperture settings. Building on the popularity and versatility of broad focal range lenses, the new AF-S 28-300mm f/3.5-5.6G ED VR is Nikon’s first FX-format lens with a 10.7X zoom range for enthusiasts and professionals. The new 28-300mm is the all-in-one optical solution that is ideal for travel, landscapes, portraits and capturing distant subjects. The 28-300mm VR lens is optimized for edge-to-edge sharpness on both FX and DX-format D-SLR cameras, and has an equivalent focal length of 42-450mm when attached to a DX-format D-SLR. It’s optical formula includes two ED glass elements that effectively minimize chromatic aberration, even at the widest aperture settings, and three Aspherical Lens Elements that virtually eliminates coma and other aberrations at wide aperture settings as well. This high performance lens also incorporates an M/A Focus Mode Switch that enables quick changes between manual and autofocus operation, and Internal Focus (IF) providing fast and quiet autofocus without changing the length of the lens while retaining working distance through the focus range. The new AF-S 24-120mm f/4 G ED VR zoom lens redefines the wide-to-portrait lens category, and provides users with a medium focal range lens with a constant aperture that is ideally suited for a wide variety of photographic disciplines. This high performance lens offers a constant maximum aperture of f/4 to maintain exposure settings throughout the entire zoom range and is perfect for photographing landscapes, portraits, interiors and weddings. The 24-120mm f/4 also features two ED elements, three aspherical lens elements, a useful M/A Focus Mode Switch, Internal Focus and Nano Crystal Coat to reduce ghosting and flare for greater image clarity throughout the entire frame. A highly anticipated lens for professional photographers with no room for compromise, the new AF-S 85mm f/1.4G ED is an ultra-fast classic portrait lens boasting amazing picture quality, high performance and the ability to create dramatic background effects (bokeh). This lens is engineered for professional portrait, studio and wedding photographers wanting to shoot at fast maximum apertures while retaining the highest performance. The 85mm lens is also well suited for portraits and low-light shooting situations because of its ability to create a shallow depth of field with exacting sharpness and detail. The AF-S 85mm f/1.4 is optimized for edge-to-edge sharpness on both FX and DX-format D-SLR cameras, and features two focus modes, M/A (manual-priority autofocus) and M (manual) to further enhance versatility and adapt to a shooters needs. Additional features include Internal Focus (IF) that allows the lens to focus without changing the barrel length, Nano Crystal Coat to reduce instances of ghosting and flare, and a rugged construction build to endure aggressive field use. This entry was posted in Nikon D3100, Nikon Lenses and tagged Nikkor 24-120 f/4 VR, Nikkor AF-S 85/1.4G ED, Nikon AF-S 28-300mm F3.5-5.6G VR. Bookmark the permalink. Trackbacks are closed, but you can post a comment.